We all want our children to go to good schools, right? And, let’s face it, some schools are way better than others. Who wants to send their seven-year-old to a school with broken toilets and no sports fields? And when it comes to high schools, we want our teenagers to get the best chance of passing Grade 12 in a school that has properly stocked science labs, computers and class sizes small enough for teachers to handle. But what if you can’t get your child into the school you want? 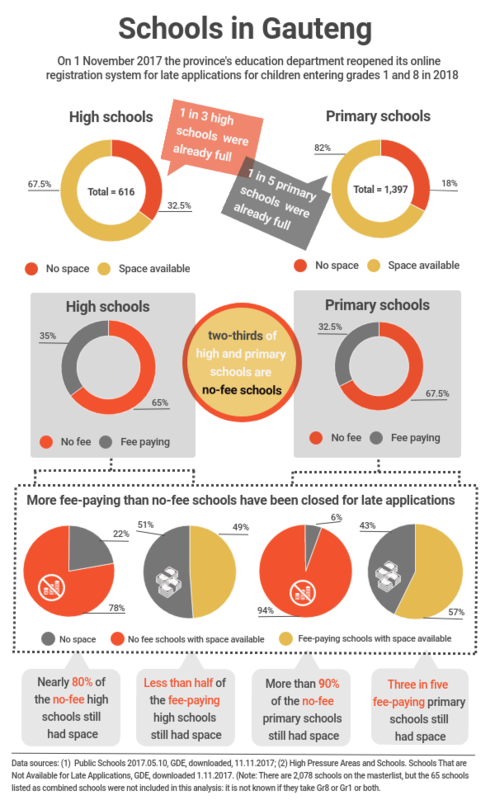 On November 1, when Gauteng’s online registration system opened for late applications for grades 1 and 8 for the 2018 school year, I took a look to see which public school options were available for my youngest, who’s starting high school in 2018. Not one of the four high schools near to where I live, and to which I’d choose to send my child, had places available. In fact, by November, 402 schools had “received applications beyond their capacity” and were not available for late applications, Panyaza Lesufi, the head of Gauteng’s Education Department (GDE), said in a media statement when the online registration system opened again for late applications. The GDE posted a PowerPoint document entitled High pressure areas and schools. Schools that are not available for late applications on its website. There were 457 schools on the list, but three of the schools were listed twice, and there were a couple of mistakes in the numbering so altogether there were 451 not-available schools on the list – 248 primary schools, 201 high schools and two “combined schools”. You can see where all the full schools are in an interactive map at the end of this story. The most striking thing about the department’s list of “full schools” is how a small number of high schools seem to have received a huge number of applications for grade 8. According to Lesufi, by 1 November, 98,928 of next year’s grade 8s had been placed in a school. Incredibly, 40,292 applications – 40% of the number that have been placed – were submitted to just 34 high schools. Each of those high schools received more than 1,000 applications for grade 8. The combined capacity of those 34 schools was just over 8,300, according to the GDE. So more than 20,000 parents who applied to one of those schools at the beginning of this year would have been turned down and their child offered a place in another school. There are 616 high schools listed on Gauteng’s latest available masterlist, so those 34 really popular schools are just 5% of the high schools. What’s also interesting is that all these schools, except for one, are fee-paying schools. Phumlani Secondary in Katlehong is the only school that isn’t a former Model C school and it’s the only one that’s a no-fee school. In contrast to the high schools, only three primary schools got more than 1,000 applications each for grade 1 by November: Laerskool Akasia, Laerskool Theresapark and Bryanston Primary School. According to Lesufi, 123,450 grade ones and 98,928 grade eights had been placed in a school by November. But that’s only 77% of the 285,834 learners who applied before November. That means more than 60,000 learners who had applied early had yet to be placed in a school. There’s a lesson in this for parents: if you want to get your child into the school of your choice, apply early. The interactive map below shows where the schools that were full by November 2017 are (red dots), and where those that were therefore likely to still be open for late applications (yellow dots). Hover over the dots and zoom in to explore the schools yourself. Join our email newsletter and be the first to know when we release new data. Taco Kuiper Fund for Investigative Journalism at Wits University.